Canadian Music Week kicks off May 6, and for the first time in 32 years, the weeklong festival isn’t being held in the middle of winter. Also for the first time, the festival will be competing directly with North by Northeast, the bigger, arguably hipper Toronto festival that draws iconic performers such as Iggy Pop alongside hundreds of local and international acts. North by Northeast, which takes place in June, has introduced a radius clause that prevents artists playing NXNE from booking shows within the Toronto market for 45 days before the festival dates, ruling out the opportunity for bands to play both festivals. It’s a strategic move, and one that has forced many bands to choose one festival over the other. As far as radius clauses go, NXNE’s is somewhere in the middle. Coachella’s radius clause falls on the extreme side, forbidding bands from playing in the Los Angeles market for up to three months before, during, and after the festival. South by Southwest, a more comparable festival, is much more relaxed: its clause states that artists agree not to perform any other public night shows (7 p.m. to 2 a.m.) in Austin during SXSW and to limit appearances at non-SXSW events to no more than one per day. This clause allows for after parties and day parties, and gives bands the opportunity to play additional shows in the area. For Jesse Crowe from Beliefs, a local band that was selected by NXNE as one of the top 60 Canadian acts from last year’s festival, the radius clause is a mixed blessing. On one hand, Crowe says the fact that Beliefs is playing NXNE has given her the chance to showcase an act at CMW that she doesn’t feature very often—her solo project, Praises. “It also opens things up so that more bands within the community have the opportunity to play that maybe were denied because the same band played both festivals before,” she said. Thousands of bands apply for these two festivals and, in previous years, the local line-ups were sometimes similar. But Crowe is not without her doubts. Traditionally, Canadian Music Week immediately followed SXSW, which is held every year in March. 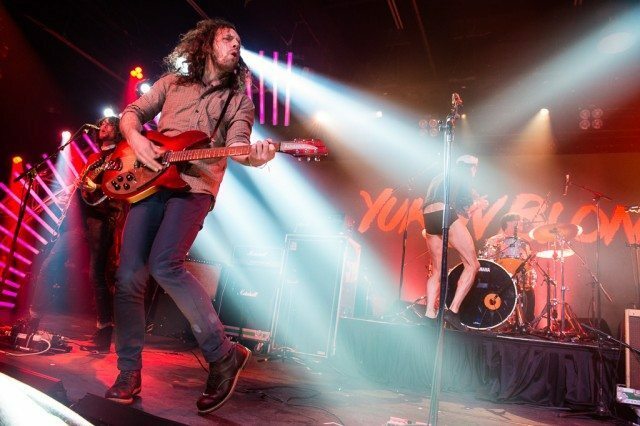 It was not uncommon for bands playing the Texas-based festival to come play Toronto after, bringing labels, press, and agents along for the ride. “There was a direct path between who was going to both, which I think made Canadian Music Week, especially last year, really good,” Crowe said. NXNE and CMW are similar in some ways. Both take over dozens of Toronto bars and feature hundreds of acts from around the world. They offer extended last calls and late-night performances, and now each will offer official daytime parties and free shows. Because of its new home in May, Canadian Music Week will be able to provide things winter prohibited it from offering before and to amp up its acts. MIA will be playing a free show at Tattoo Rock Parlour this weekend, for example, and the festival has succeeded in securing higher-profile performers, including Ellie Goulding and Tegan and Sara. But NXNE remains the larger player, with extended festival dates, a proven track record, and a well-developed interactive conference. For some bands, the decision was easy. Papermaps became a catalyst for the debate when singer Dean Marino expressed anger about the radius clause in what he thought was a relatively private Facebook post. “I got a lesson in social media back in December when I got a call from one of the directors of NXNE talking to me about my Facebook wall,” he said. Papermaps had been invited to play NXNE prior to his post, but he says the festival got defensive. “I don’t have a preference for one festival or the other. I’ve benefited from both festivals in the past,” he said. “I was basically given an ultimatum by North by Northeast: either choose one or the other festival.” Papermaps chose CMW. As Canadian Music Week strives to be more about artist development, and NXNE strives to be more like SXSW, this year will be an experiment in coexistence.